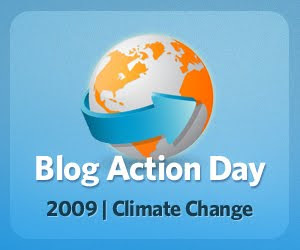 Happy Blog Action Day! Thousands of bloggers all across the world are talking about Climate Change. Before I talk about something as big as climate change, I want to talk about something as small as a story book. On International Peace Day, I read my students a book about peace, entitled, Peace Begins with You. The title says it all: Something as big as international peace begins with something as small as the individual person. How we treat each other day in and day out determines what kind of world we live in. The same is true for climate change. The kinds of habits we have on the individual level affect the kinds of habits that get manifested on a larger scale, and those larger-scale habits determine what happens on a massive scale--in this case, with global warming and our climate. The kinds of people we choose to be and the kind of lives we choose to live have huge ramifications for the kind of world we create and inhabit. Don't get me wrong; I still believe that corporations rule the world and entire industries have a much greater impact than a tiny individual, but corporations and industries and governments are, at the end of the day, comprised of individuals--individuals with certain values that manifest themselves on a larger scale. So what the heck does this post about climate change have to do with weddings? Weddings are an amazing opportunity for us to clarify our values, to decide what kind life we want to live with our partners, and to share those values and that life with our larger circle. But we hardly ever talk about weddings in this way. Instead, we get swept away by pressure from the Wedding Industrial Complex to focus almost exclusively on the details of the day. If we're not careful, our weddings will quickly begin to reflect the values of our dominant culture, which include materialism, consumerism, and the prioritization of external beauty over internal substance. Matt and I worked hard to resist pressure from the Wedding Industrial Complex in order to create a wedding that reflected our values and the kind of life we wanted to forge together. But boy was that difficult! We faced doubts and judgments from certain family members and friends. We spent hours upon hours trying to find a wedding venue that wasn't really a wedding venue. We calculated and recalculated costs in a persistent attempt to stay within our budget. We dealt with the emotional turmoil that comes from swimming upstream against the current of "the way things are done." We also faced the dilemma of conflicting values. Yes, a $15 wedding dress from Target reflects our desire to conserve money but it conflicts with the value we place on healthy working conditions and supporting local businesses and independent artisans. But the truth is, when you align your actions with your values, you usually can't go wrong. Matt and I were able to have the best possible wedding for us because we took the time to delineate our values and then figure out specific ways to manifest those values. Avoided unnecessary decoration and additional "stuff"
Hmm...that's all I can think of for now. Other ideas? We picked the location of our house (currently under contract and looking good to go to close at the end of the month!) specifically to be within walking distance of the "village center" (grocery, restaurants/bar, personal services, even a farmer's market during the summer!, etc). We lucked out and it's within walking distance of the library, too! It's closer to walk than to drive due to a wonderful, amazing, fantastic trail system that runs all over our city (well, it's really an unincorporated area). I am also able to take public transit to work in the large city north of us. Unfortunately, there are no public transit options for my fiance, so he drives the 30 - 40 min to work. First I have to say that I love your blog. I read it throughout my wedding planning and have continued to read even though the wedding has come and gone--thanks for all of the great posts! Second, I'd love to know where you got the net bags you mentioned for fruits and vegetables. My husband and I use canvas grocery bags and don't use the little plastic produce bags unless it's an absolute must (ie: green beans, peas, brussel sprouts, etc.). It would be great to have something reusable to bring with us for those few items. Thanks!! You guys should look into SolarCity, it's a solar panel leasing program. Not sure if they're in Texas yet. We just had a solar consultation last week. Check out their website if you haven't already, you can rent solar panels for your house for ~$50/month and cut your fossil-fuel power consumption by 50% or more. One more thing...when we have the shower water on in the morning waiting for it to get hot we collect the water in a big bucket and then water our trees and dry patches of lawn with it later. Our own little gray watering system! Oh Sara, you are a girl after my own green heart! And this is totally shallow, but I picked cloth napkins over paper towels because I could make pretty ones! And I collect vintage plates and cups (Can you really beat .25 a plate?!) for parties, again, because they just bring that extra something and it's a great ice breaker. "Oh, what plate did you get?" i especially like the line about deliberately living in smaller spaces. living in nyc has made me realize i don't need/want a house as big as the standard home. separate living room/play room; kitchen/dining room - no thanks! not necessary! I totally agree with everything on your list and will strive to incorporate many of the same things in my own life....but PEE IN THE SHOWER??!?! Seriously?!?! I thought I was the only one who peed in the shower! Ah! Really, it's such a good idea! I'm sure you tire of hearing about people's blog worship of you, but your blog has comforted, entertained and informed me so much in the last few months. I came here first for budget, eco-friendly wedding advice, but the relationship/lifestyle insights you share are much more valuable to me. so, thanks! In combination with the library a book swap is another fun idea. As for peeing my girlfriend uses the yellow = mellow, brown = down rule. My husband hates that idea. Another thing you can do as a teacher is to use your power of influence to teach good green habits to your students. I'm starting an environmental club at my school. What a great site! I've got so many brides looking for ways to have a classy wedding and still be frugal. I'm going to pass this site on. Power strips! I swear by them, and we regularly pay $20 a month for a 2 bedroom half of a house. I selectively flush ("if it's yellow let it mellow" and such), and we live in an old building here in Barcelona which has an actual chain you pull to flush the toilet... which seems obnoxious when you're used to a button or handle, until you realise that you can pull it for shorter or longer periods of time depending on how much water you need/want to use. So when my fiancé complains that I didn't flush, I can use just the bare minimum of water and still keep him happy. I love it! Also, totally get power strips with on/off switches. But don't forget to plug the phone into one that doesn't get turned off! @Kate, I got my reusable, lightweight (fair wage, organic cotton, etc.) cloth produce bags at EcoBags.com. They do weigh a little, but spending the extra like €0.10 is worth it to me to not be using plastic! (I got a set of 4 or 5 and have enough to wash (and hang dry) some while using others. They do shrink a little, though, so get the bigger ones!) I also got a set of 5 large net bags (that really do hold up to 40 lbs.!) for a great price there, too, so definitely check out the sale section! (The ones with both short and long handles are the best b.c of all the different ways you can carry them.) I had enough net bags that I've been able to give them away to friends and family. For some other eco-conscious idea's - I found this site http://thespeciale.com/ Special E is a unique "green" business that rescues items left over from meetings, trade shows, banquets, galas, parties, weddings, and special events…then recycles and re-purposes them in ways that help our planet and people in need. I'm hoping to use them since not all of the items at my wedding will be entirely eco-conscious and at least then those items can be repurposed for others. It's pretty nifty. The other thing I know I'm going to do for my bridesmaids...I believe you mentioned it in one of your other posts http://www.envirosax.com/ I'm going to use these as the bags to put all their goodies in. Also - I found http://www.idealbite.com/blog/top-10-nontraditional-wedding-gifts so I can register for some not-so-ordinary things and http://www.charitygiftcertificates.org/ which is a gift certificate that allows the recipient to choose what charity it goes to - so you don't have to pick just one! I'm also using several hand made items that I found on etsy...and my wedding dress is going to be made out of my grandmothers wedding dress from 1946!! Planting a tree together during your wedding is so original. I hope that tree is still there 40 years from now and you are celebrating those years together. It was so touching. One of the best ways to save energy is to turn your computer off when not required. This blog has been demmed uneccesary, so you could save the environment by not blogging. Each subsequent blog you write will add damage to the environment. Is it worth it? Psst-- re: eco-friendly doggie bags-- did you know that most of them aren't actually any more biodegradable than a regular plastic bag? I was devastated, I try so hard. If the box says that the bags aren't in compliance with whatever the California law is (it'll say CA code and then some numbers and letters), it's the equivalent of a regular plastic bag. I'm sure you already knew that, but just in case!